Nothing deals harsh weather conditions more than our roofs. Roofs protect us from direct exposure to hail storms, rain, strong wind, and harmful UV rays of the sun. As it consistently deal with different weather conditions, eventually our roofs will experience different problems. Some common problems will be cracked and broken tiles, leaks and moisture, clogged gutters and down pipes, and moulds. Regular maintenance helps extends the lifespan of your roofs and prevents any more costly restoration or repairs in the future. The Legend General Services, a licensed roofing service company in Sydney and has been providing quality service the people of Sydney and other nearby places for 7 years, is consists of a team of professionals who take pride in our roof restoration and roof maintenance Sydney expertise. The Legend GS is currently offering 10 years warranty on roof restoration (Dulux 962 roof membrane) and for every roof restoration we offer 2 FREE whirlybird installations making us the best company for roof restoration services in Sydney. 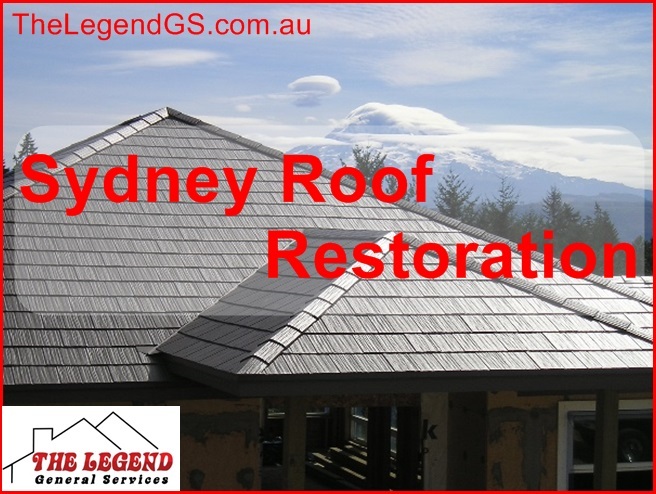 The Legend GS does not only offer roof restoration repair services in Sydney it also offers services such as broken tile replacement, roof cleaning, roof painting, roof replacement, re-roofing, and replacing of the roof all for a very affordable and reasonable prices. Our dedicated team of experts are insured and work with integrity to the highest professional standard for quality results and workmanship. As one of the leading roof restoration service provider in Sydney, we are well known to adhere to standards and regulations according to the roofing standards in Australia. Our technicians will not leave your home until you are 100% satisfied with the results. Let our committed team of professionals to help you define the best solution for your Roof Restoration Sydney, Broken Tile Replacement, Roof Cleaning and Roof Maintenance. Get the most competitive quote for these services by calling 1300 109 021 to discuss your roofing needs and get a free quote.